A settlement has been reached in the fatal Amtrak 188 crash in Port Richmond last year. Amtrak has agreed to payout a record $265 million to victims and their families. The settlement was approved by a judge today. The crash happened in May of 2015. The train was going 106 mph in a 50 mph zone around a curve at Frankford Junction when it derailed. 8 people were killed and over 200 were injured. The deadline for victims to join the settlement is November 21st. Claims may be processed and paid as soon as next June. 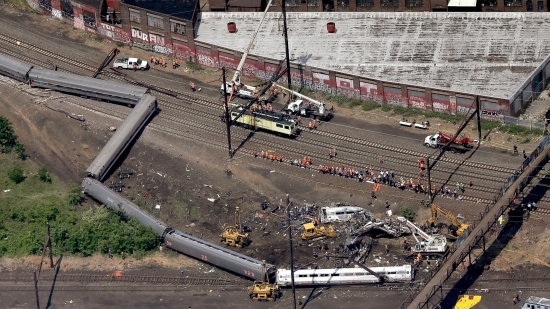 In response to this crash, Congress rasied the damages cap for train accidents from $200 to $295 million last December. The woman who confessed to slashing the tires of two city-owned vehicles outside of Philadelphia District Attorney Seth Williams' home has been sentenced today. 47-year-old Stacey Cummings was sentenced to 12 months probations and must enroll in a Accelerated Rehabilitative Disposition program or ARD. Cummings also has to complete an anger management course. She has already paid $845 in restitution to replace the tires. The case had been turned over the Delaware County DA to avoid any conflict of interest. Williams and Cummings had an ongoing relationship. She was listed as his girlfriend on recent financial disclosures. She had been charged with criminal mischief and use of an instrument of crime. This afternoon, Rain, temperatures in the mid 50's in Center city.